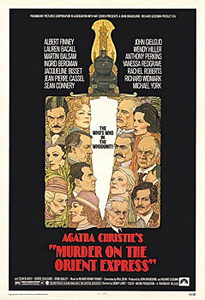 Cast: Albert Finney (Hercule Poirot), Lauren Bacall (Harriet Hubbard), Ingrid Bergman (Greta Ohlsson), Sean Connery (Col. Arbuthnot), John Gielgud (Mr. Beddoes), Anthony Perkins (Hector MacQueen), Vanessa Redgrave (Mary Debenham), Martin Balsam (Signor Bianchi), Jacqueline Bisset (Countess Andrenyi), Michael York (Count Andrenyi), Rachel Roberts (Hildegarde Schmidt), Richard Widmark (Ratchet), Wendy Hiller (Princess Dragomiroff), Colin Blakely (Cryrus Hardman), and Jean-Pierre Cassel (Pierre Michel). 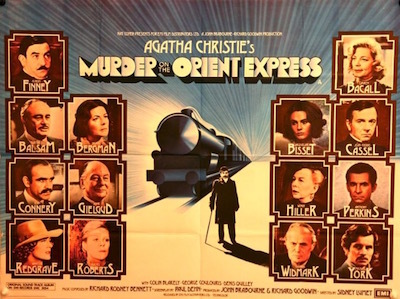 Agatha Christie never dreamed up the star-studded casting for this version of her classic mystery, Murder on the Orient Express, but it certainly makes for a good journey. Top performances by most of the cast add to the thrill of a puzzling mystery set aboard a luxury train trip in the winter of 1934. 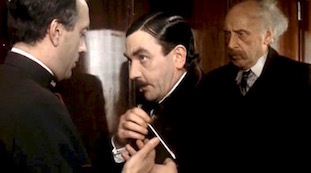 Sadly, there is only one actor who fails to impress and that is the bizarre performance of Albert Finney as the Belgian sleuth, Hercule Poirot. 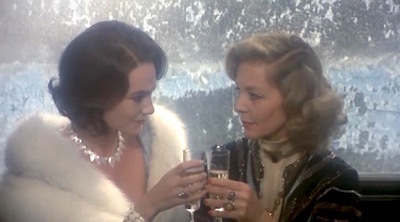 Despite this odd and unfortunate performance, Sidney Lumet's production is so fine that it easily propels Murder on the Orient Express to our 13 must-see murder mystery movies. En route back to England from Istanbul, Hercule Poirot encounters an old friend, Signor Bianchi. Bianchi serves as a director with the prestigious Belgian firm, Compagnie Internationale des Wagons-Lits, operator of the luxurious Orient Express. 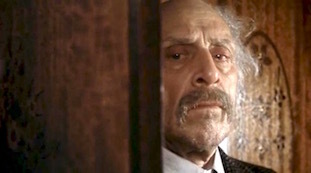 Happy to meet his famous friend, Bianchi insists on securing accommodations for Poirot aboard his company's train. Soon after boarding, the detective is confronted by a determined American businessman, Mr. Ratcliff. 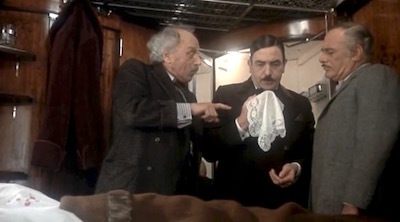 Ratcliff anxiously tries to enlist Hercule Poirot to investigate the mystery of who could be threatening his life. 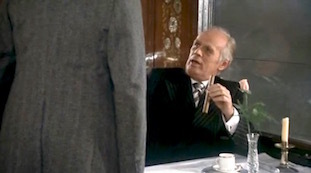 Poirot, obviously finding Ratcliff's manner offensive and recognizing that Ratcliff is, at best, a shady character, politely but firmly declines to be of service. As the train chugs on toward Paris a heavy snow is silently falling. All of the passengers are asleep and, perhaps, don't even realize that sometime in the dead of night, the train has been forced to stop because of snow so deep that the tracks ahead must be cleared. Early in the morning, Ratcliff is found dead in his first class compartment, brutally stabbed 12 times. 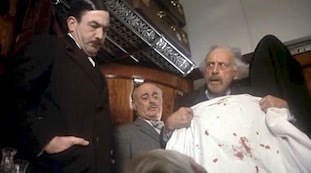 Signor Bianchi enlists the aid of Poirot to solve the case. 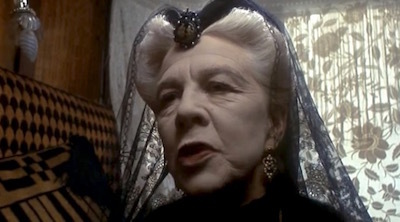 Almost immediately, Poirot discovers that Rachett had been using an alias. 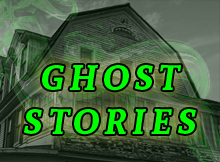 His true identity was that of a vicious gangster, Cassetti, who had been accused of kidnapping and subsequently murdering little Daisy Armstrong. Daisy, the 5-year old daughter of a famous British colonel who was living in America, had been kidnapped from her nursery. An enormous ransom was paid. Tragically, the child's lifeless body had later been found. There had been two kidnappers. One escaped but the mastermind of the evil plot, Cassetti, had seemingly fled the country and disappeared. The tragedy of the Daisy Armstrong case had made headlines around the world and left behind a string of tragedies. The little girl's mother, overcome with grief, had died. Her father committed suicide because he was too distraught over the loss of his child and wife to go on. Little Daisy's maid, at one time falsely accused of being involved in the kidnapping, also had killed herself. It seemed that everyone connected with the murder of this innocent child had experienced such grief that it changed their life forever. All except Cassetti. After committing the heinous crime and collecting the ransom, this heartless and cruel man had changed his identity and, as Rachett, had used his ill-gotten gains to travel throughout Europe. He'd gotten away with kidnapping and murder and caused the death of others but he had gone unpunished. Unpunished that was, until he boarded the Orient Express. 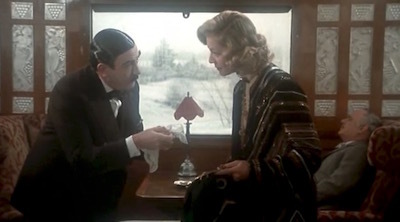 Now, Cassetti was dead, brutally stabbed in a bizarre and puzzling manner, and Poirot knows that among his rich and famous fellow passengers on the train, he must find Cassetti's murderer. 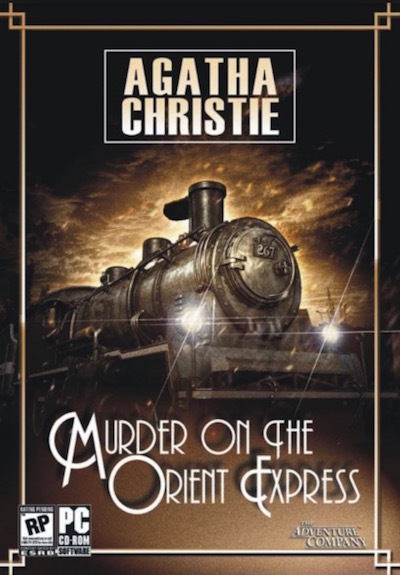 What ensues is a marvelous puzzle and Agatha Christie's plot is as intricate as they come. Watching the international cast of stars in this movie is great fun, as well. Particularly good are Lauren Bacall as the eccentric Harriet Hubbard and the timeless beauty, Ingrid Bergman as a Swedish missionary. 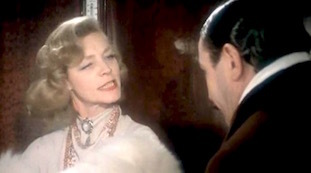 Bergman's portrayal of dowdy and timid Greta Ohlsson, who was returning from Africa where she cared for ‘little brown babies', earned the her an Academy Award (the actress's third Oscar win in her career) in 1975. Albert Finney's quirky mannerisms and wildly affected accent make him more of a cartoon than an accurate characterization of Christie's detective. 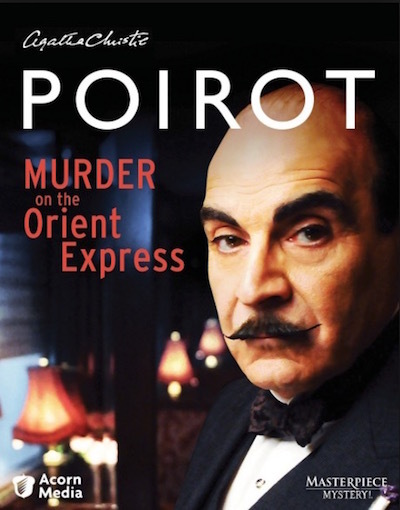 While Agatha Christie certainly created Hercule Poirot as an intellectual man of small stature with an enormous ego and a unique appearance, she never could have pictured as silly a man as Finney envisions his Poirot. 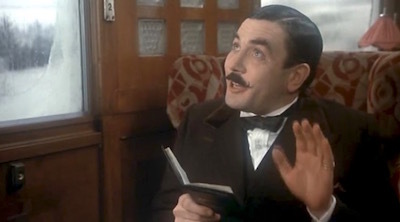 Throughout the film, Finney chortles and snorts and stomps around the train becoming more of a distraction than an asset. 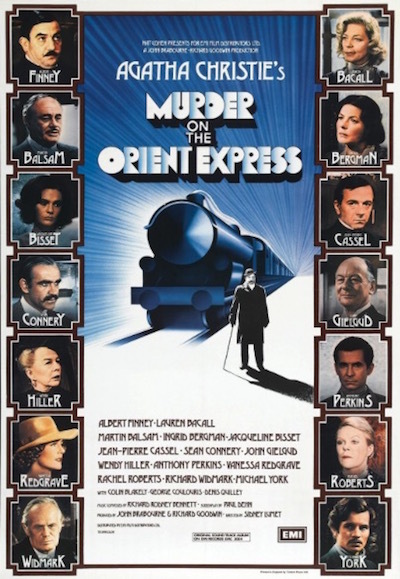 Despite this fatal casting, Murder on the Orient Express is a deliciously fun film to watch and one that every murder mystery fan will want to add to their collection.